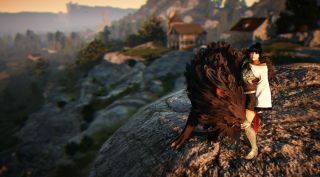 The upcoming fantasy MMO Black Desert Online is now taking registrations for its first closed beta, which will run from December 16 to December 22. The beta promises a number of improvements over the alpha test that wrapped up last month, including greater character customization options, improved class balance, and better weather cycles. Black Desert Online is an open-world action MMORPG that promises "the deepest character customization of any game currently on the market." It features "intuitive skill-based combat," with six character classes—Warrior, Ranger, Sorceress, Berserker, Valkyrie, and Wizard/Witch—with their own unique skills and powers. It will be sold "as a premium service, not a subscription model," with purchase prices ranging from $30/€30 to $100/€100. Access to the closed beta will be given automatically to anyone who owns the Conqueror's Package, but if you don't want to throw 100 bucks at this thing just to see what it's like, you can put your name in the hat here and hope for the best. Registrations for the closed beta will be taken until 12 am PST on December 9.